ood Revolution day which is a campaign created by Jamie Oliver to provide access to real, nutritious food to all children. He is encouraging all of us to get back in the kitchen and cook simple meals for our loved-ones. What’s not to like? Spring is a great time to try new recipes. 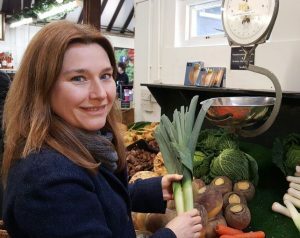 New vegetables are appearing on the supermarket shelves and at local markets. But do you always know what to do with them? Cooking is a great activity to pursue with your family. You will discover new ingredients and you will spend quality time with your children and partner. Ok, I admit, it can get tricky if you have a small kitchen. But if you plan your meals in advance and decide who will be in charge of the various tasks involved, you will be fine and it will be fun. Yes, cooking should be fun. Selecting the ingredients, preparing them and waiting to taste the food should be exciting. Savouring the dish is always the best part. Let’s celebrate home-cooking! 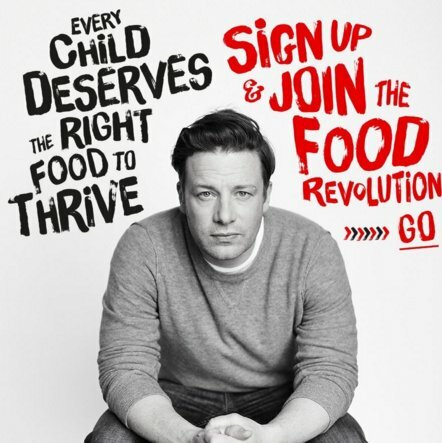 Let’s support Jamie Oliver and his Food Revolution Campaign! For this post, I have selected Asparagus, Chard and Radishes which can be prepared very simply. But with a little effort, you can turn these veggies into the star of your meal. 2. Wash and steam the asparagus for 15 minutes or until tender. 3. During that time, peel and chop the onion. Cook the chopped onion in a pan for 1 minute and add the salmon fillets. Add salt and pepper and a little water. Cook for 10 minutes over a low heat. Once the salmon is cooked, remove any skin and flake it. 4. Beat the eggs with the flour and add the milk. Add salt and pepper. 5. 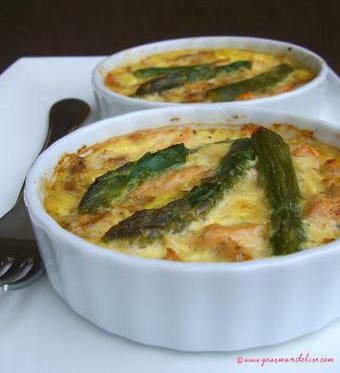 Place the salmon, the onions and 2 asparagus in each ramequins. Pour the egg mix on top. 6. Place the ramequins in the oven for 25 minutes at 200°C. Cut the chard leaves and cook in salted boiling water for 5 minutes. Drain well. Heat up 2 tablespoons of olive oil and cook the garlic until it starts changing colour. Crush the garlic and the anchovies (if using whole anchovies) with a fork adding the remaining oil bit by bit to create a paste. Return the paste to the pan and add the chopped tomatoes. Add salt and pepper and cook for 10 minutes stirring the sauce from time to time. Add the chard leaves and cook for another 20 minutes. We are all so used to eating radishes raw with a little bit of butter and sea salt (à La Française) or simply in a salad but did you know that they are also delicious cooked. Here is a great recipe from The Kitchn blog. Cut the potatoes in quarters lengthwise and toss with 1/2 tablespoon olive oil in a large bowl, as well as a generous pinch of salt and pepper. Spread the potatoes on a large baking sheet and bake for 10 minutes or until barely tender. Meanwhile, trim the tops (use these in a vegetable soup) and bottoms of the radishes, and quarter them lengthwise. Trim off the top and bottom of the fennel bulb and slice in half lengthwise, then quarter each half and cut the quarters into pieces about 2cm wide. 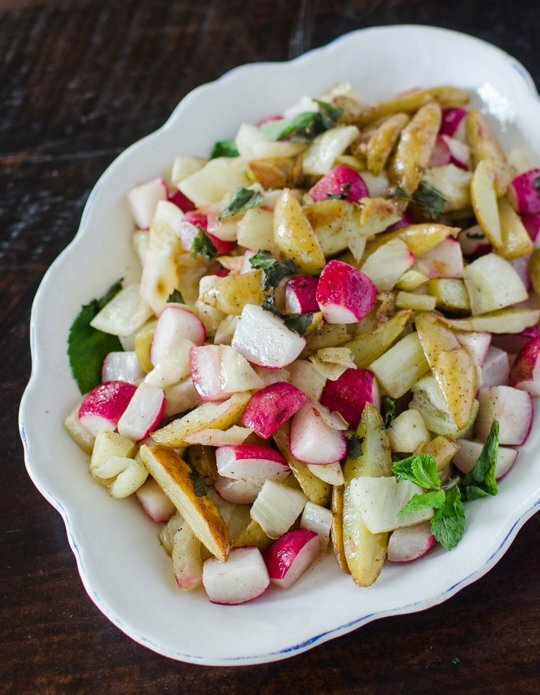 Toss the fennel pieces and radishes in the bowl with another 1/2 tablespoon of olive oil and salt and pepper. When the potatoes are just beginning to get tender, spread the radishes and fennel on the baking sheet and toss to combine. Return the vegetables to the oven and roast for an additional 10 to 15 minutes or until the fennel and radishes are tender and juicy but not yet soft. While they are roasting, heat the butter in a small saucepan over medium heat for 4 to 6 minutes or until it melts and then browns. Remove from the heat and carefully whisk in the lemon juice, mustard, and the honey. When the vegetables are done, toss with the sauce and spread on a platter or in a bowl and garnish with mint or dill leaves. Serve immediately. I hope you will enjoy these recipes and support Food Revolution Day. If you feel that you and your family would benefit from a little help in the kitchen, I run very informal cooking workshops. Visit this section of the website to find out more.